Those that are cheap enough to be considered disposable. Those that are more costly, but stand the test of time. 1. Balls. Cheap dog ‘tennis balls’ won’t last long for most dogs but they are popular and don’t cost much either. Kong manufactures a good quality, fairly robust tennis ball, which has a squeaker for added play value. A ball on a rope makes a fun alternative, and some people find these easier to throw. The Kong Squeezz ball is collapsible to an extent when chewed, which can feel very satisfying to a dog. 2. Squeaky space lobber (hopper) toys. These are hugely popular, but fairly easy to destroy – first the squeak is removed, then the stuffing, then finally the casing will be shredded. I’ve seen them last in some ‘state’ in a household of dogs for weeks, providing oodles of fun.Don’t leave unsupervised as you’ll want to pick up the stuffing once it’s removed and also the casing if it gets torn off. The little one makes a great training aid as it has a loud squeak and is small enough to be easy for both human and dog to handle. 3. Strings of plastic sausages on a knotted rope. Another extremely popular toy with dogs of all sizes. Cheap enough and fairly robust, providing hours of fun especially with a friend. Great tug toy. They do get chewed, but usually in stages over time. 4. Knotted rope tug toys. Great for chewing and tug of war. Cheap, fairly robust and can be machine washed. Slipped this one in because it’s wonderful… not as cheap as most, but a great gift. Gorgeous quality gift tug toys for any dog. 5. Cheap soft, stuffed or flat material toys. Yes these will be eventually be destroyed, so buy at a price where you don’t care – and don’t throw the carcass away once all of the stuffing has been pulled out. 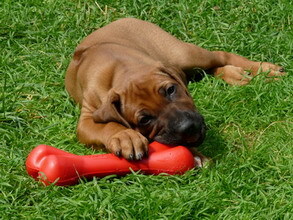 ‘Deflated’ soft toys make great tug toys and have often been a favourite with the dogs when I have been home boarding. 6. Hollings mini roast bone. These are the safest bones I have come across, and I use them all the time without any problems with splintering. They seem compelling to most dogs and are pretty indestructible and cheap. Like the more expensive Stagbar antlers, these bones provide ongoing chewing over many months. Buy Hollings mini bone on Amazon. 7. Kong toys. The whole Kong range is wonderful and is loved by most dogs, but favourites include the Wubba range, Squeezz jells, Safestix, Squeezz stickand the Classic Kong (for stuffing and leaving with a ‘home alone’ dog). Kong toys wear really well and most take a long while to show signs of wear and tear. The addition of material makes the Wubba range slightly more vulnerable, but they are well made and compelling to dogs. 8. Other strong, chewable treat balls. These either have a hole or grippers for treats. This one is a multi purpose ball which is really strong yet collapsible rubber, with a hole for treats, but still designed for outside use, bounces and glows in the dark. Great all rounder. Add to that, the ethical nature of the company. A small percentage from the sale of these balls goes to the planet dog foundation, which works to support and train dogs for service to people in need. 10. GoughNut. For the ultimate lifetime guaranteed chewable, retrievable, floating dog toy, look no further. Expensive, yes – but you’ll only ever need to buy one, as the company will replace the GoughNut free of charge for the pet’s lifetime, if the internal red core is exposed. Please note that an purchases made via the links on this page will generate a small referral fee to the site owner. This does not affect the amount that you pay for the item, but is paid out of the percentage Amazon take from the sale.